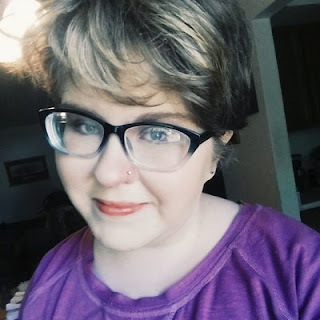 I'm guest posting today over at Muse, a blog by fellow teen writer Seth Skoegerboe. I'd love it if you'd stop by and check it out. I’m a reader, and I’m a writer. Sometimes I wonder if those things aren’t intertwined. I started reading when I was three years-old and I’ve had an irrevocable love of words ever since. I wrote my first “book” when I was very young, after being steeped in the classics like Hop on Pop by Dr. Seuss and Where the Wild Things Are by Maurice Sendak. It’s funny how words work and how potent stories are. It’s funny how they seep into our subconscious and remain with us forever. It’s funny how, by reading stories, we are inspired to write our own. It's been a while since I last participated in the Character Letters meme hosted by Rosamund Gregory, but I saw the new edition up and thought I'd give it a try again. This is a blog meme much like Beautiful People except it's dedicated to first-person character development. It's just as it sounds; you write a letter from the perspective of your character. Last time, Elleri was my victim of choice. This time it's Kaysie, the main character of a futuristic semi-dystopic novel that I started on a whim. It's nameless and plotless and I love watching it take shape beneath my fingertips. This letter is self-explanatory (I hope) but it's basically Kaysie reacting to the current events that are taking place in the plot. Lots of stuff going on, guys, and I don't know the half of it. This letter really did help me flesh out the depth of Kaysie's feelings for Cy and her feelings about the event that's currently happening. I really liked getting a chance to get inside Kaysie's head and act her out for a little bit. It was good to really feel what she was feeling and figure out what she's been thinking. She'd write the letter on plain paper, though, at any rate. And probably hide it under her mattress once it was completed. You’ll probably never read this. Just know that… well, I know. I know about you and her. I know how you feel about her, because I see it in your eyes. I can’t say that I like it… but… what can I do? It’s love. It’s tricky like that. And yeah… I’m happy for you. But in a weird way, I’m not. Because you’re in love with the girl that tried to kill me. And somehow that just doesn’t settle well. Yes, I know she didn’t mean to. Or so you say. But I’m just not convinced. We live amongst warriors, Cy. We’re trained to be evil, to destroy, to turn against each other in an instant. We’re cunning people, we’re spies, assassins, warriors—because we’re trained to be. How can I know if she’s really my friend? How can I know that you’re really my friend, for that matter? You think it’s silly, these notions of mine… but think about it. Any one of us could turn on each other in an instant. Why? Because that’s what we’re trained to do, Cy. It’s what we’ve been raised to do. Betrayal is all we know. And it scares me, you and her. Both of you do. Because you’re getting tangled up in her web. And yes, you both are my friends, but for how much longer? I’m afraid she’ll ruin you, Cy. And if there’s one person I can’t live without, it’s you. I didn’t even know it till now, but you’re my solid rock, the one person I can count on. And now that you love her… I’m afraid that will change. I never wanted to be the jealous best friend; I’m sorry. I wish I didn’t feel like this. For what it’s worth, you have my congratulations on your newfound love. I hope it lasts, for your sake. And mine. Because… yeah, I love you. And I just don’t want to see you get hurt, no matter what happens. Writing a fantasy novel is always fun, until you realize about halfway through that you have no idea what you’re talking about. When I started Silver Tears last November, I never knew how much I didn’t know about fantasy settings. These are only a few of many things I don’t know. Yes. Oh, deer. That spelling is intentional. At one point during my novel, my characters shot a deer. Then they proceeded to gut it. The only problem? I have no clue how to gut a deer. I found an easy-to-follow guide and the information stuck with me. So it is that I know the basic idea of how to gut a deer. This is one of my proudest accomplishments. One of my weaknesses is that I don’t know much about horses. I think they’re beautiful animals and I love them. But I know virtually nothing about how they walk, eat, and live. This is rather inconvenient when one is writing a fantasy novel where horses are the main source of transportation. Not only that, but my novel also contained a long journey where... yep, you guessed it, my characters rode horses. Thank you to Georgie for helping me with many of the issues that stem out of my lack of horse-knowledge. Like when I didn’t know how much dead deer meat a horse could carry. Or when I had to figure out the specifics of getting trampled by a horse. Stuff like that. I love swords. I love duels. I love battles and climactic fight scenes. Those are what make my favorite movies so awesome. Add in an awesome soundtrack or two, and you bet that’s a movie I’m probably gonna love. But much like horses, when it comes to writing, ’tis much different. You see, I don’t know much about swords either, other than my crash course in Lord of the Rings last year. I have stood outside a cutlery shop, where I proceeded to stare at the shiny swords on the wall for a good ten minutes. I also indulged in a fair bit of daydreaming about my characters and their weaponry. And of course I was wishing I could own one of those gleaming blades. For research purposes, obviously. But when it comes to the technicalities of sword fighting, the different maneuvers and the way it all works, I’m clueless. This became especially clear to me yesterday when I realized I didn’t know how one sharpens a blade. And yet despite the lack of information, I love to write about swords as much as ever. I end up drawing on my experience in Nerf sword battles a lot. 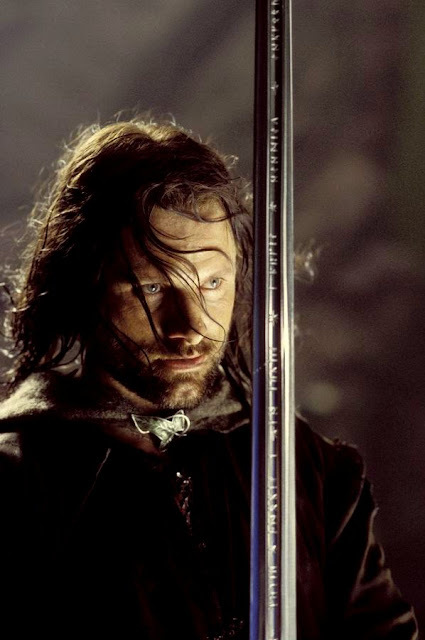 Here's a cool picture of Aragorn. In Silver Tears, my character Gavin Gray is a blacksmith. He’s a good one, too. It’s irrevocably woven throughout the plot and plays a pretty big role. It's pretty hard to miss—he is a blacksmith. I really need to go look up the nuts and bolts of blacksmithing because... yep, you guessed it, I’m pretty clueless. I mean, yes, I know some things, but I basically make it up as I go along. First draft and all that. Anyone know where I can find Blacksmithing for Dummies? What’s one thing you don’t know? Further Up and Further In has a change of scenery, a new design. Check it.